NASA astronaut Mike Massimino, who gained Internet fame as the first spaceflyer to send Twitter updates from space, is about to get another taste of stardom, this time on the CBS sitcom "The Big Bang Theory." Massimino, who has 1.2 million followers on Twitter, will guest star in the latest episode of the science-themed TV comedy, which airs tonight (Feb. 2). The veteran astronaut's last trip to space was on NASA's final flight to the Hubble Space Telescope, but he said his TV appearance ranks close to floating in orbit. "It's a fun show and I'm excited about it and so is my family," Massimino told SPACE.com of his appearance. "This was right there amongst the most fun things I've ever gotten to do." Massimino, 49, plays himself in the show about a group of brilliant and socially awkward physicists at Caltech. His appearance is tied to a plotline about the character Howard Wolowitz, an aerospace engineer who plans to travel to the International Space Station. The real-life astronaut said the program helps portray scientists as "people who can have fun, too." In addition to showing the lighthearted side of science and engineering, Massimino praised "The Big Bang Theory" for its relative accuracy. "They're really big on getting the story right, even though it's a comedy," he said. "When they do make references to some scientific or engineering phenomenon, they really try to get the story straight. With Wolowitz going into space, they wanted to try to make it realistic." The experience of acting was all new for the veteran spaceflyer, who joined NASA's astronaut corps in 1996 and flew twice on the space shuttle. "The last time I was in a play was in first grade; I was an elephant," Massimino said. "Afterwards, my mom took that elephant costume and converted it into an astronaut costume that I wore." About two weeks ago, Massimino went to California to spend two days on the "Big Bang" set, including one day of rehearsal and then a performance in front of a live studio audience. "It kind of gets your heart going," Massimino said. "Not quite like a space launch or a spacewalk, but similar to that. I could feel my heart rate going up right before I was going to say my lines. It was really cool." However, he's not completely new to the small screen. Massimino starred in a series of NASA behind-the-scenes videos showing a glimpse of NASA astronaut life, and he also downlinked daily video updates during his most recent space shuttle flight, to refurbish the Hubble Space Telescope. The astronaut is not the first professional spaceflyer to moonlight on television. 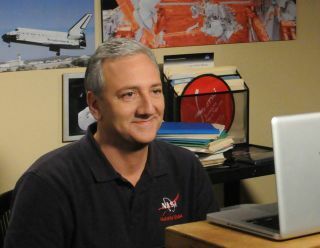 "Mike Massimino has now joined a small cast of NASA astronauts who have made cameos on sitcoms, dating back to Gemini and Apollo veteran Jim McDivitt meeting Bobby and Peter on 'The Brady Bunch' in 1974," said space history and collectables expert Robert Pearlman, editor of SPACE.com partner site collectSPACE.com. "John Glenn appeared with Kelsey Grammer on 'Frasier' in 2001 and Buzz Aldrin yelled at the moon with Tina Fey on '30 Rock' in 2010." And in August 2011, the four-member crew of the final space shuttle mission, STS-135, visited the set of "The Big Bang Theory," though the astronauts didn't appear on-air. Massimino himself isn't exactly a stranger to television, either. In July 2010, the astronaut appeared on "The Late Show With David Letterman" to discuss the retirement of the space shuttle program and life as a space man. Massimino is a native of Franklin Square, N.Y., and is married with two children. He has a Ph.D. in mechanical engineering from MIT. His first trip to space was in 2002, aboard the space shuttle Columbia's STS-109 mission to service the Hubble Space Telescope. He returned to the orbiting observatory in 2009, aboard the shuttle Atlantis' STS125 mission — the fifth and last trip to upgrade Hubble. "A number of the astronaut-actors have been from Hubble Space Telescope servicing missions," Pearlman said. "Two Hubble crews appeared on the show-within-a-show 'Tool Time,' on the Tim Allen-led sitcom 'Home Improvement,' to demonstrate their space tools." Massimino's episode of "The Big Bang Theory" will air Thursday (Feb. 2) at 8/7 p.m. Central. Check local listings.